Vitamin D is a fat-soluble nutrient and is one of the 24 micronutrients critical to human survival. It is found naturally in fish and eggs and is added to dairy products, but the sun is the major natural source of the nutrient. The body produces vitamin D from cholesterol, provided adequate amounts of UV light from sun exposure. However, there are only sufficient amounts of UV light coming from the sun when the UV index is 3 or higher, which only occurs year-round near the equator between the 37th parallels. The skin requires direct sun exposure for the UVB rays to penetrate it. The RDA for vitamin D is currently set at 400-800IU/day, but this is likely too low for adults. The safe upper limit in the United States is currently defined as 2,000IU/day, and in Canada it's 4,000IU/day. However, research suggests that the true safe upper limit is 10,000IU. Supplemental vitamin D is implicated in wide-ranging benefits, such as increasing Cognition, immune health, bone health, and well-being; reducing the risks of cancer, heart disease, diabetes, and multiple sclerosis; and increasing testosterone levels in deficient populations. It is best taken with meals or a source of fat ( such as Fish oil ). There have been anecdotal reports of it causing trouble sleeping when taken later at night, so it might be best to take it earlier in the day. 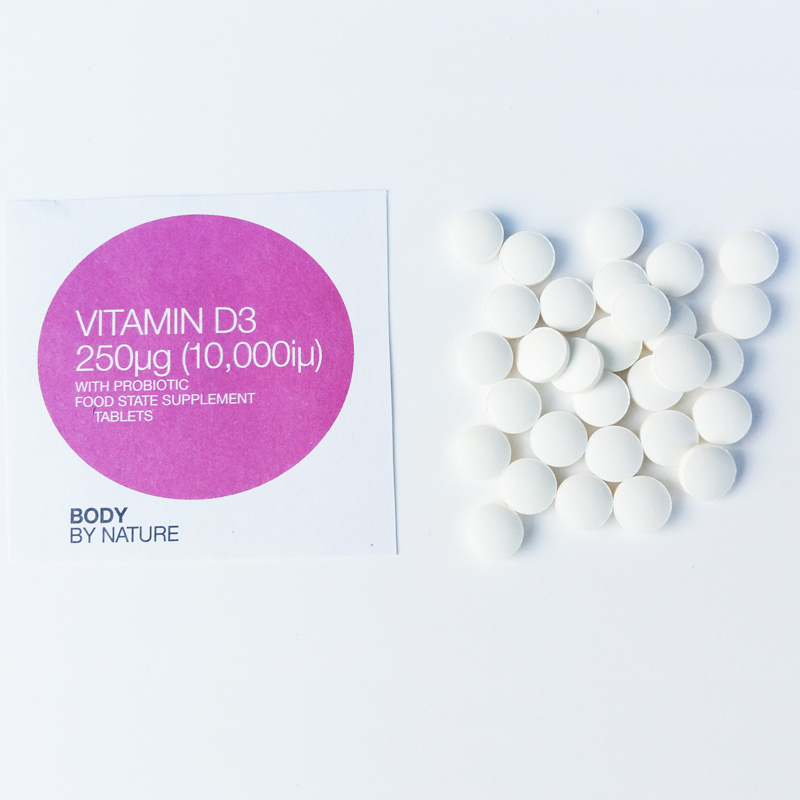 Vitamin D3, also known as the sunshine vitamin, is important for strong bones and teeth. It plays a major role in healthy cell development and helps keep the immune system strong. Has been shown to promote muscle health, breast health and colon health Vitamin D3 is the most bio-available form of this nutrient (Vitamin D). Food State Vitamin D3 supplements are beneficially combined in a base of Pro-biotic which provides all the necessary food factors to aid absorption in the body. Those who suffer from a lack of vitamin D are the Elderly, pregnant women and those that venture outdoors occasionally. Evidence has recently pointed towards the idea that we need around 50μg/day. All organs of the body especially the immune system. Essential for the absorption of calcium. Normal function of the immune system and inflammatory response. Extremely low allergy risk due to this pro-biotic fitting into the normal metabolic pathways. Neutral taste as well as smell. Lactobacillus bulgaricus* (from milk) combined with vitamin D3. *Lactobacillus bulgaricus is a friendly probiotic bacteria.